Do you want to Download Mi Account unlock Tool and Bypass / Remove Mi Cloud verification, then you are in the right place. Mi Account Unlock Tool is compatible with all smartphones Xiaomi Mi redmi that runs on MIUI ROM. All Xiaomi devices come with Mi account associated with them that allow backing up all your important things including contacts, audio, video, messages, pictures, notes, and more. This will be very useful when the user buys a new Mi phone and wants to get all the data from the old phone. All you need to do is enter your existing Mi Account login credentials to your new phone and the data will be automatically synced to your new handset. Is not this really cool? Lost Your Mi Account ID and Password – What to do? Suppose for some reason you have made a factory reset on your MIUI device. In this case, you must re-enter Mi Account login credentials to sync all data from Mi Cloud. If you forgot your password, just tap “Forgot Password“. This will help you to get back your Mi Account. However, there are also some users who have reportedly lost their Mi Account ID and Password. In this situation, the user needs to download Mi Account Unlock Tool and Bypass Mi Cloud account verification. This is one of the safest procedures without voiding the warranty phone. What is Mi Account Unlock Tool? 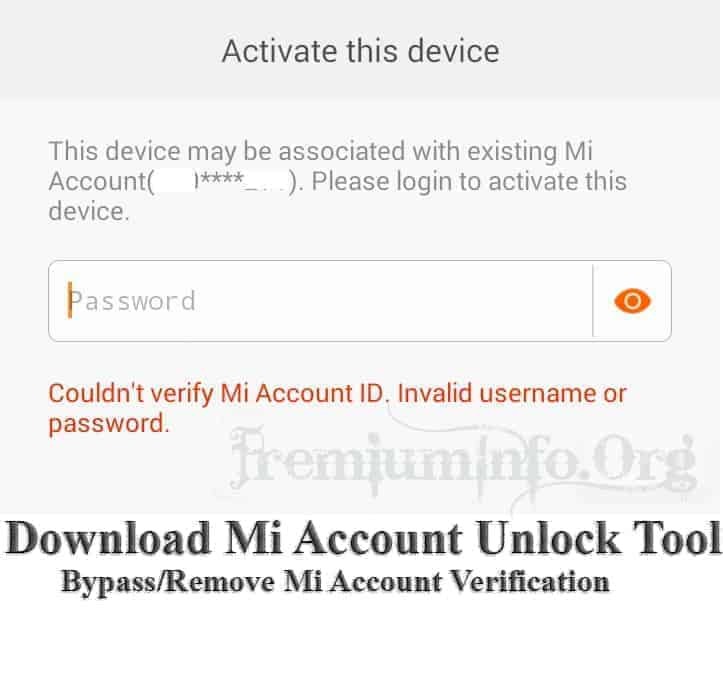 Mi Account Unlock Tool is a special software developed to remove or ignore Mi Cloud verification every time you forget Mi Login & Account Password. 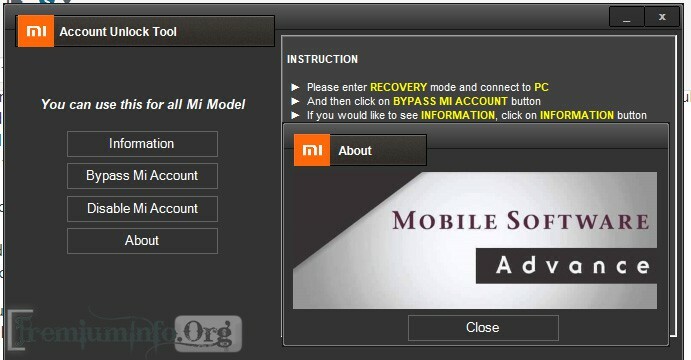 With this tool, MIUI users can Bypass Mi Account or Disabled Account. This way is also intended to correct errors such as “This device can be associated with an existing Mi account“. You can install this software on Windows XP / Vista / 7/8 / 8.1 / 10 and delete the Mi Account from your Xiaomi phone. Xiaomi smartphone users can easily restore factory settings or Mi Cloud Account bypass with this Toolkit. One should simply boot the device into recovery mode and then follow our simple steps to unlock forgotten password. 1. First, download the Mi Account Unlock tool from the download file above to your computer. 2. Extract the .zip file and run the file “ .exe ” as administrator. 3. Boot your device into recovery mode recovery mode. To do so, you need to press and hold the ” Volume up + Power ” button. 4. Connect your device to the PC using a standard USB cable. 5. Go to the Mi Account Open Tool and tap ‘ Information ‘ to confirm whether the device is connected or not. Note: If you can not see device information into the tool log window it means the device is not recognized by the software. Be sure to reconnect your device or install the correct Xiaomi USB Drivers. 7. Finally, you need to click on ” Bypass Mi account “. 8. The device restarts automatically. Congratulations! You have successfully unlocked or bypassed Mi’s account verification using Mi Unlock Tool. That is all! If you have any questions related to the tutorial above, write a comment below. We will come back with the most likely solution. to see the site, that’s what this site is providing. I have the redmi note 6 pro and i unlock it but i cant connect to the intertet so i cant activate my phone! can somene help me or this app is supporting my device? Ele faz o processo todo, não chega a 100% e reinicia automaticamente, entra na tela MIUI 10 mas em 10 segundos volta a tela de bloqueio novamente.